I am breaking my ‘there has to be at least 1 local ingredient’ rule to include this dish. It is one of our favorite simple, basic entrees. Whenever we haven’t had fish in a while, and I feel the need to give Cam a real shot of protein, I know I can turn to cornmeal-crusted tilapia and have him (and the rest of us) down a good meal. We used to have a farm-raised tilapia operation about half an hour from my house, but that is not where the fish we can buy comes from. 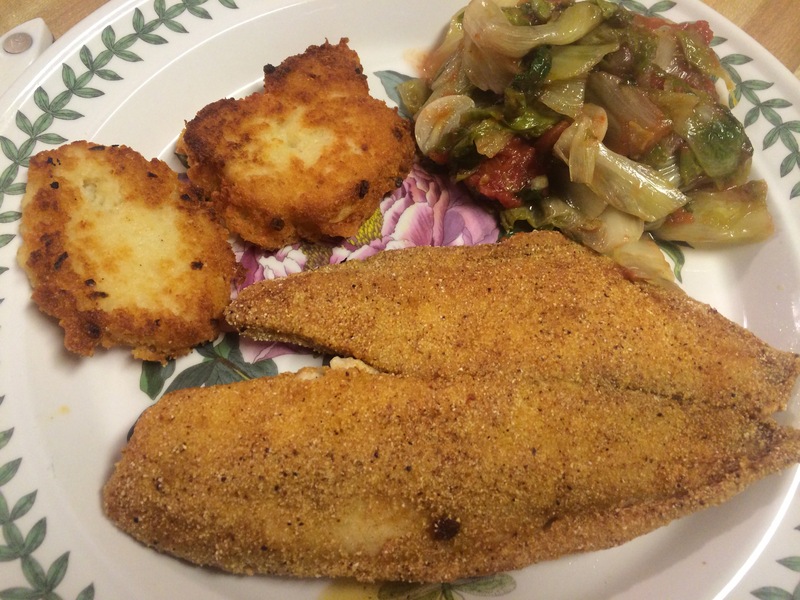 Tilapia is a fairly bland fish, but the texture lends itself perfectly to the cornmeal crust and light frying. Combine the cornmeal, flour, cumin, chili powder, cayenne pepper, and salt in a shallow bowl. Rinse the fish and dredge in the cornmeal mixture. Heat a thin layer of oil in a heavy skillet. When the oil is hot, place the dredged fish in the skillet and fry till cooked, about 3 minutes per side.